The Grand Haven village, The Crossings, offers all the benefits of living in the Grand Haven gated community but with a carefree lifestyle of no maintenance required on your home. Patio homes in The Crossings range from 1400 to over 2100 square feet and they are situated on a naturally beautiful wooded preserve. Because homes in The Crossings at Grand Haven are maintenance free, these properties appeal to families who may not live in Florida year round. Or a resident might prefer that professionals maintain the landscaping and home exterior for them so that it is especially well done on a dependable, regular basis. All the amenities of Grand Haven come along with a home in The Crossings: proximity to the Intracoastal Waterway as well as use of the Village Center with fitness club and spa, pools, classes and events, and eating establishments. And of course golfers will be pleased to have access to the award-winning par 72, 18-hole Jack Nicklaus Signature golf course. 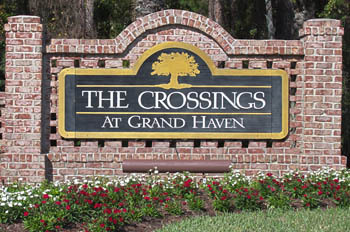 If The Crossings sounds like the perfect place for your new home in Palm Coast, contact us today.